If like me, you were under the impression that once you have potty trained your toddler, you will be rid of the bulky Changing Bag, then I’m sorry to disappoint you, but you will not be. You can read all about the contents of my changing bag when Baby Z was much younger here. In fact, I am starting to wonder when I will be able to take out my glamorous clutch purses again, and it doesn’t look likely for the near future. Having said that, since Potty Training Baby Z, and as he has grown older, the changing bag has thankfully grown lighter in some respects, and I can even get away with leaving it in the car if we are only a short distance or time. So without further ago, here’s what I carry in my changing bag post potty training. This changing bag, like my last one, is from Babyshop. It is not the most glamorous but it does the job well, and I love it because of it’s endless number of compartments. Since my husband has a phobia of handbags, I asked him to pick out whichever changing bag he felt comfortable carrying around, if the need arose. As I mentioned before, I tend to leave it in the car most of the time as it is used more for emergencies, so I do not mind that it does not go with all my outfits, but having lots of different allocated spaces plays an important role. This is because emergencies tend to get one flustered, and when I am in such a condition, I want to find what I need in a jiffy, rather than searching for it in an endless pit of toddler items. This cream and olive green bag ensures that with zips and compartments aplenty. It is also super light and compact. It also has two water bottle holder on either side, handy to carry mine as well as Baby Z’s water bottle. Inside, Baby Z’s changing bag mainly consists of clothes, because even though he is potty trained, he is still susceptible to the odd accident, whether it be toilet related, or something else entirely like falling sick etc. Therefore, I always have the following on hand: Two pairs of trousers, 2 T-shirts, 2 underwear, a pair of socks and a jumper. I have found a change of clothes to also be handy for those impromptu trips to the beach or outdoor water fountain since living in Dubai means this happens a lot. The jumper is also in case we enter a mall or space which has really cranked up the AC, as they all tend to do during the hot Dubai summers, so this is an all year round item I keep with me at all times. 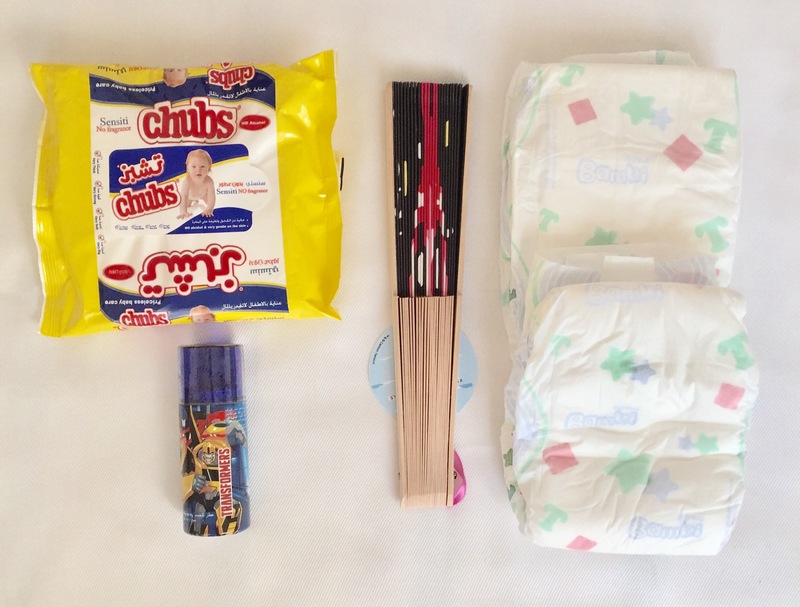 Apart from clothing, I also keep a pack of Chubs Wipes and two spare nappies in the Changing Bag, because sometimes toilets may not be as accessible depending on where we are or what situation we are in, and for convenience I like to carry these with me. As for the wipes, these are a mother’s best friend. Enough said. I also keep a hand fan, though with the oncoming winter, I don’t think it will be needing it anymore. The latest addition to this changing bag, made by Mr Z, is a small bottle of kid’s perfume. Though I find it laughable, it actually came in great use to covering up the smell of Baby Z’s sick when he vomited just a few weeks ago. A peculiar thing to carry but highly useful, so I would recommend you do the same! That’s all for the contents of Baby Z’s changing bag. It’s basic and practical for accidents and emergencies concerning a toddler. Of course, there are a few other items I carry of his in my own handbag such as his snacks and toys, but they change every day depending on his mood. However, these contents shown above are the same and travel with us wherever we go. I hope you found this post useful, and please feel free to share what you carry in your changing bag post potty training in the comments section below. Do you still carry one around, or have it as a backup in the car like myself? Also, if anyone could tell me when the Changing Bag era will come to an end entirely, that would be great! Well, if you get to know when it ends, let me know too. After 6 years, we still carry wet wipes, a bottle of water and a jumper/bolero for battling the blast AC at most places! haha, I fear we will be carrying their water bottles even when they’ve hit mid-30s! Yup, the jumpers are a must have everywhere here! interesting tip about the perfume! Thanks! The smell of vomit makes me gag so it was a life saver! Perks of parenting eh?! Oh I’ve forgotten how it feels to hold a clutch!! Yes, I now ditch the changing bag if I have a huge purse where I can fit in all those items too, but seriously, when will I be able to put my hand inside my bag without pulling out a toy car!! ha!